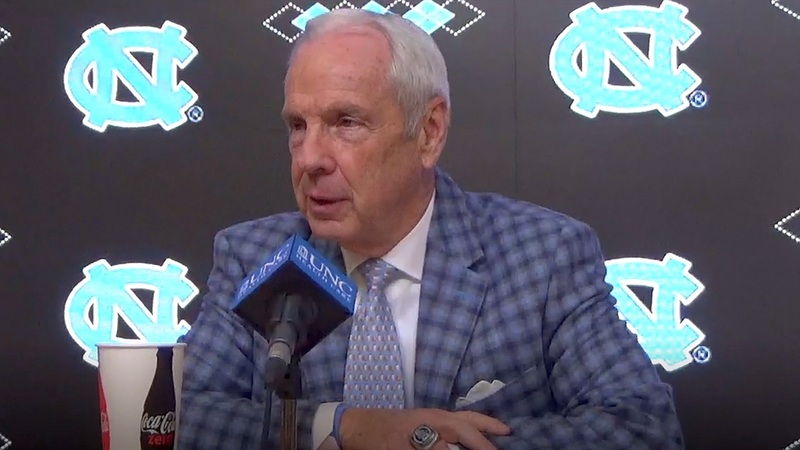 Roy Williams: "We Did Some Really Good Things"
North Carolina head coach Roy Williams met with the media after his team's 113-96 win over NC State. There were a lot of things that I really, really liked. Shooting 56 percent for the game, but I don't like the fact that they shot 50. We had 26 turnovers on 37 baskets, that's pretty good. But we had 17 turnovers. I told Braxton Beverly we're the best thing in the world for him. Every time he sees us, he makes every shot. They had a really difficult time in the game Saturday and it's hard to bounce back from that, but I thought Kevin [Keatts] had his team ready. They were enthused in the whole bit and we just got a stretch right then at the first half that we made a bunch of shots and then all of a sudden we were running it up and down and getting real good shots. I was pleased with what our guys did. Their pressure tends to make you stand around and dribble the ball and the other four guys watch what that one ball handler's doing so we didn't do a very good job of that, but their pressure is good pressure. For us, you know you look down and we've got five guys in double figures and Luke [Maye] with 31 and 12 and Coby [White] 21. But for us, again, everybody's got to be playing close to their potential if we want to be really good. I thought in the second half, their pressure hurt us and we started making some silly plays, but I feel good about it. 41 [to] 27 on the backboards, but that's misleading because we just got them 21 [to] 18 in points on second shots. But all in all we did some real good things and got a home win. We've got a little stretch here. We get to play a couple of games at home and we've got to play every single night and see what the heck happens. I was going to say no because I thought you were getting ready to say the best performance of his life because last year, he had something and looked like freakin' Superman out there. But tonight was good. He took two terrible shots in a row and missed both of them so if you take those away, he'd be 10 for 13. He was really good and he was the only guy that was rebounding for a while. He got every rebound and if he didn't get it then North Carolina State got it. I'm very pleased for him except for his four turnovers. If I knew that, I'd get him to do that against everybody. If you play golf, it's courses for horses, horses for courses. So maybe it's something like that. He's a hard matchup because he's a guy who can score inside. He's a guy who's a good rebounder but can also shoot the ball. He can go right or he can go left. He's a good player and a hard matchup for a lot of guys. He was very focused, I thought today, during shoot around. I thought he'd play really well tonight. Well, we just need to get him to stop fouling. He spend a lot of time sitting over there with me in the first half and fouling the guy on a free throw on the first shot of a two-shot foul is not the smartest thing I've ever looked at. But if he can stop doing things like that he'd get to play more minutes, too. You go back to what I said earlier in the season, he's dependable. We can count on him to be in the right spot and I think his defense on the screen on the ball is extremely important to us in this game just like it was over there. He's getting better. He made a really beautiful pass, a little bounce pass to Luke in the middle of the crowd. He had a silly one throwing it out of bounds in the first half down on the far end, but I think he's getting better and better. He's a better shooter than 6 for 16 and 2 for 5. He's still a freshman academically, but by the time you've played 22 games, you're more experienced so I expect him to keep getting better. No, I'm not going to say that. Looking at the tape, I thought if I'm watching it I'm going to say they played much harder. If Kevin watches it he's going to say we played much harder. I think we got some fortunate bounces for us late in the first half… I was mad at halftime at 16 because we gave them four straight rebound opportunities to get a three at the end but I would not say that about them. I'm one of those guys that doesn't believe you need to lose to have good things happen. We could've played crappy and won off a 55-foot shot and I'd have been much happier. I think it did one very positive thing. That's the last time we had crappy practices the day before or two days before a game and since then, the preparation and focus in practice immediately before a game has been really good. I was really pleased with what we did in the first half except for a couple of plays. In the last one, we were giving four shots but in the second half, we acted like – none of you guys are old enough to know the Keystone Cops routine – we were throwing the sucker everywhere. People sitting on the front row had to pay attention because we were throwing the ball in every direction. I think we are getting better defensively. We're paying better attention to the rebounds, to the backboards… We had two [threes] in the second half and it seemed like we had five, so it would be three. My math is a little better than that. I think we're getting better, but I don't know if I would say I'd compare them to anybody else right now. I had the same kind of question in the press conference yesterday. I don't really ever look and say 'Okay, this is where I want to be right now or this is where we were,' to answer your question, after 22 games, ten years ago. I have a really good memory about junk like that. I do try to go to practice every day and get better and I told them, the last thing I said, we'll have clips pulled from this game and there will be a lot of negative clips because we've got to get better. That's corny as all get out, but that what I focus on every single day.